Every military operation requires efficient, tactical, and precise execution. In times of peace, military forces participate in peace support operations (formerly military operations other than war) [Joint Doctrine for MOOTW]. This operation involves gathering information by using all available resources which includes the use of advanced computing equipment with compatible keyboards. Moreover, the military-grade industrial keyboards, along with ruggedised PCs, were designed to handle such complicated tasks in any working environment including arid, wet, or rocky terrain. Its stainless-steel metal construction has a shock absorbent lining which protects the internal components from structural damage. Thus, it ensures the keyboard to retain its functionality despite daily transportation across rough terrain. So, in this blog, discover how rugged keyboards are utilised in various military peacetime applications. Peacetime military operations include overseeing an area of interest, setting up humanitarian response teams, and protecting civilians under imminent threat in any environment [Peace Support Operations]. During these undertakings, military personnel should have access to a functioning panel PC integrated with an accurate peripheral device. Having an industrial-grade keyboard installed to industrial PCs is a great option as it bears a responsive mechanical key button. It is designed to prevent dual key input issues and improves the overall response time. Also, this device has fully backlit LED keys which makes it easier for the operators to use even in dark areas or environments with poor lighting. So, what other features does this military-grade mechanical PC peripheral have which makes it ideal for military applications? Find out more in the succeeding section of this blog. Rugged keyboards remain functional despite critical military operations. This results in a device perfectly capable of handling all kinds of military applications. 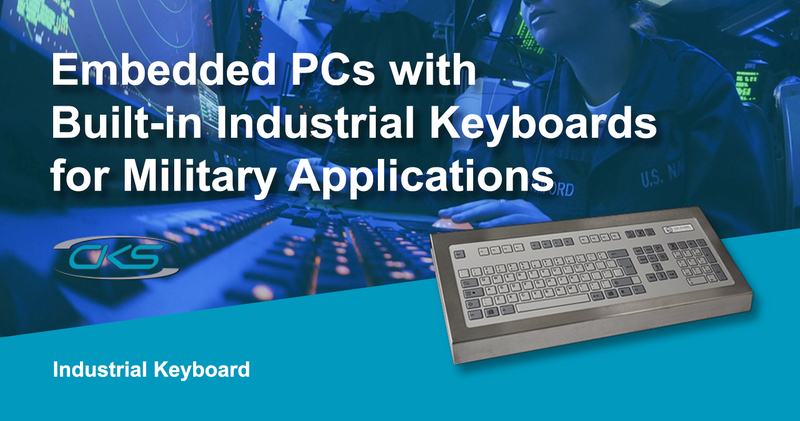 Here are some of the best features of industrial keyboards when integrated to military PCs. This keyboard is built with a chemical resistant coating which prevents damage from oils, water, and liquid cleaning chemicals. This ensures that the device can function efficiently despite the exposure to these hindering substances. The rugged keyboard’s structural design and material ensure its functionality in any climate and environment. In fact, it can be utilised in a wide temperature range, providing its functionality in any location and situation. Military-grade mechanical keyboards were built to have long-term availability. So, expect that this device can function well even infrequent usage. Military operations require a reliable, and durable equipment to precisely carry out critical missions. So, they utilise military-grade computing devices when executing operations in extreme environments and rough terrains. However, apart from installing industrial PCs, embedding ruggedised keyboards is also an essential factor for these kinds of military application. Contact a trusted industrial computer manufacturer for more information about industrial keyboards.